Everybody nowadays has one or more mobile device – wheatear it’s an iPhone, iPad, an Android device, blackberry or even an e-book those gadgets are everywhere. But how can you make them visible and comfortable to use when you are not holding them? iOmounts think it has the perfect solution. 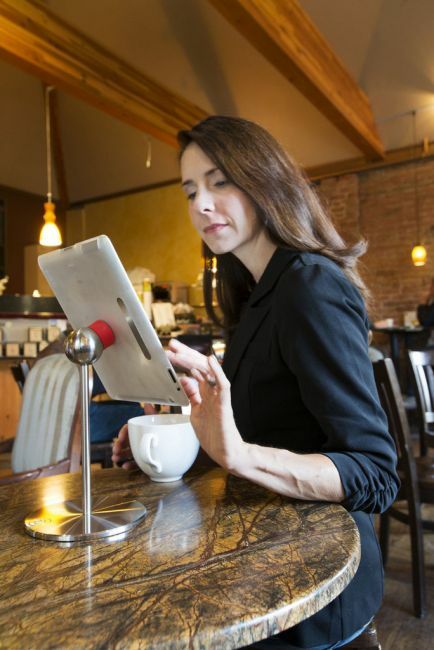 iOmounts is a family of mobile device stands with a twist. They can hold a small device like a mobile phone or a larger one like a tablet and allow the user to easily manipulate the device and rotate it in any direction. There are 3 different stands/iOmounts – the iOstand for larger devices such as tablets and e-books, the iOmini for mobile devices and the iOwall for mounting any of the two on a wall. Each of these units actually comprises of two parts: an iOadapt (a ring type magnet you attach to the back of your device or case – but be careful to attach it only to a smooth case not to a silicon or leather one) and the stand itself. Once you connect the iOadapt to your device (using 3M special glue) simply put your device on your iOmount and you are good to go – twist and turn it in any direction and the ball-head will make sure it will stay in this position until you pick it us. Ideal for Skype talks, reading, watching videos or getting those recipes in the kitchen. The iOadapt is really thin – 0.04 inches thick only, so it should not get in the way of using your device, putting it on a flat surface etc. Although the iOadapt is magnetic it should not affect your device (unless you are using one of those old hard drive based iPods in this case – it can erase your data). The devices comes in 3 colors – white, chrome and black and prices range from $60 for the iOwall to $100 for the iOstand (with the iOmini costing $90). You can find more information (as well as order a unit) on the iOmounts website.